Bucas Sterling, III has been serving God, in the Spirit of excellence, as Senior Pastor of Kettering Baptist Church since April 2000. He is a born again Christian who loves the Lord with all his heart, soul and mind and determined to serve Him with his all. His prior ministry service includes thirteen years at Mt. Calvary Baptist Church in Lanham MD, where for six of those years, he served full time, as Assistant Pastor. He also served at the House of Prayer in Grand Forks, North Dakota where he began fulfilling his ministry calling in 1985. 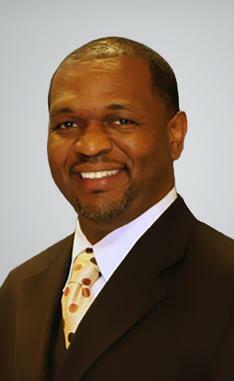 Pastor Sterling attended Prince George’s Community College, University of North Dakota and Washington Bible College. He holds degrees in Criminal Justice and Pastoral Theology. He is also a graduate of E.K. Bailey Ministries Expository Preaching and has attended educational studies through Proclaimers Place at Georgetown College, Georgetown Kentucky and Oxford University, Oxford England. He served four years with the United States Air Force. His ministry vision includes reaching the world with the gospel of Christ through the doors God opens for us while deliberately making disciples, edifying the community in areas of need.He is also very interested in exposing and preparing Christians, young and old to hands on missions work. He feels that African American churches in general have failed to develop missionaries by showing our people young and old that serving as missionaries in the field, even short term, is a viable life choice. He does concede that they will send money to the mission field but are notably absent when it comes to actual physical participation. Pastor Sterling has received many recognitions and acknowledgements to include but not limited to: the C.H. Spurgeon Award Finalist in Preaching from the Billy Graham School of Southern Seminary; the Metropolitan Who’s Who in Religion; the National Register of Who’s Who among business professionals. He received recognition from the Southern Baptist Theological Seminary and the Billy Graham School of Evangelism for church growth in the top 3% of all Southern Baptist churches and was highlighted on the Don Crowe Show in the “Meet the Pastor” segment. In addition, his article, “Workplace Enthusiasm”, was featured in WAVA’s Faith Walk Magazine, he was privileged to have one of his sermons published in the book “Oxford Sermons”, and he was selected as one of the Fabulous Fifties of Prince George’s Community College and was honored by being placed on their wall of fame. Pastor Sterling, a lifelong resident of Prince Georges County, Maryland, has been happily married to his wife, Carolyn, since December of 1983. The Lord has blessed them with three children – daughters, LaTonya and Virtre’, and son Tori, two son-in-laws, William and Ricardo, and four grandchildren, Jasmine, Jordon, Sterling and Corrari.